British Council in collaboration with the African Storybook Initiative invites writers and illustrators to participate in a residential workshop for the production of mother-tongue based multilingual storybooks. 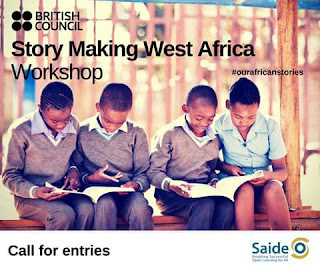 The workshop is a component of the broader Story Making West Africa project which aims to promote the arts, education and mother-tongue based multilingual education in Sub-Saharan Africa. Story Making West Africa workshop pilots an initiative to create stories in indigenous languages and is an opportunity for individual West African writers and illustrators to contribute to the production of these storybooks at any African Storybook reading level, in indigenous languages and English. Workshop Output 1: Up to 20 draft story manuscripts with ten manuscripts selected for publishing. Each manuscript will consist of 12-page stories in at least two languages (an indigenous African language and English). Workshop Output 2: Illustrators draw and colour five sets of illustrations (that is, five story manuscripts).